In an upside-down aspect of long-term care insurance, about one in four older people with a policy who eventually go into a nursing home had let that policy lapse sometime in the previous four years, forfeiting coverage that would’ve paid for their care. The questions are who does this and why. New research by the Center for Retirement Research (CRR) finds two explanations for why: a scarcity of financial resources and cognitive impairment, which limits the elderly’s ability to properly manage their finances, including their long-term care policies. Health Insurance Costs Squeeze 401ks? U.S. workers’ wages, adjusted for inflation, are stagnating, but their share of health care costs keeps going up. “Something has got to give, right? That something could very well be the 401(k) or 403(b) plan,” said Mark Zoril, a personal financial planner and benefits adviser to small companies. Six in 10 workers agreed: the rising cost of their health insurance “directly affects” how much they set aside in their retirement savings plan at work, according to a new survey gauging the “financial stress” of more than 2,000 full-time employees with health coverage. The random survey was conducted by LIMRA, a financial services research organization. Despite a slowdown in medical inflation, employees are paying a growing share of the tab for their health care. Average total premiums for family coverage under U.S. employer health plans rose 61 percent between 2005 and 2015, for example, but the employee’s share of the premium increased 83 percent to $4,995, according to the Kaiser Family Foundation’s annual report. Two out of three individual workers today pay deductibles of at least $1,000, up from 16 percent a decade ago. Health insurance is really starting to hurt. Premium increases and deductible creep, documented in the Kaiser Family Foundation’s comprehensive annual survey of employer health benefits, are eye-popping figures. Although there has been a slowdown in medical inflation and health care spending overall, the growing prominence of high-deductible plans is evidence that more of these costs are shifting to employees. These deductibles average around $2,000 for single coverage, but they exceed $3,000 for about 20 percent of single workers. Deductibles average $4,350 for a family plan, but nearly 20 percent face deductibles exceeding $6,000. Average annual premiums for single workers in these plans range from $773 to $1,021, while family plan premiums are $3,660 to $4,407. 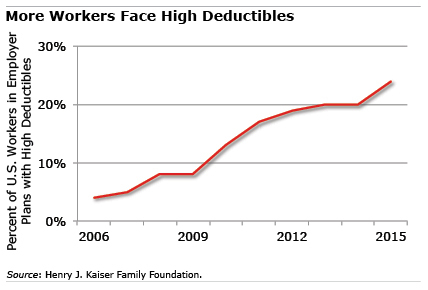 Everyone’s deductibles are rising much faster than premiums. For example, the share of the annual premium paid by all single workers with health coverage has increased 19 percent since 2010, to $1,071. But their deductibles have risen 67 percent, to $1,077. Retiree health care trends, in contrast, might be stabilizing. Since 2009, the share of larger companies offering the coverage to retirees has bounced around between 23 percent and 28 percent. Employers are also paying more for annual premiums, according to Kaiser – about $1,000 more per single worker than they paid in 2010 and about $2,800 more for a family plan. But it’s clear from the data that this shared burden falls heavily on employees. HICAP, SHIP, SHINE – whatever your state calls the program, the mission is an urgent one. With some 10,000 baby boomers turning 65 every day, these programs help new enrollees grapple with their Medicare options and make decisions, especially during open enrollment, which begins on Thursday and ends Dec. 7. Medicare is “confusing” to boomers, because they “have more than one option, and most of us, when we were working, had only the PPO or the HMO” to choose between, said Christina Dimas-Kahn, program manager and a telephone counselor in San Mateo County, California’s Health Insurance Counseling and Advocacy Program (HICAP). The top requests for assistance coming into her office are from new enrollees to Medicare, followed by the elderly who can’t afford their medications, messy billing problems between Medicare and health providers, and questions about long-term care and how to pay for it, she said. The primary goal is “education and empowering you to enroll yourself,” said Joshua Hodges, who oversees the programs for the U.S. Administration for Community Living (ACL), which funds them. Their “beneficiary focus” has become even more crucial, he said, since the advent of Advantage managed-care plans, which complicate the choices faced by Medicare beneficiaries.